My column for ConHome: Who could lead the Tories and LibDems after 2015? My tenth column for ConservativeHome — The Other Side — ran yesterday. You can read it here, as well as the always interesting comments below-the-line. Not quite a hundred yesterday but, then, the subject wasn’t Europe. My thanks as ever to the site’s editors, Paul Goodman and Mark Wallace, for giving a Lib Dem space to provoke … constructively, I hope. What result would David Cameron or Nick Clegg have to achieve in 2015 to keep their jobs as leader of their respective parties? Both will have formidable challenges in holding on. They have each fought one election and been found wanting. Mr Cameron, who commanded double-digit leads over Labour throughout 2008 and 2009, squandered his advantage when it mattered most. Mr Clegg, despite storming the televised leaders’ debates, became the first Lib Dem leader in four elections to suffer a loss of seats. Worse for their future prospects, each has disappointed their parties’ supporters while in power. The Conservative leader is a moderate pragmatist leading a party of increasingly dominated by zealots which has come to regard those character traits as unforgivable flaws. The Lib Dem leader is a moderate pragmatist leading a party always dominated by purists who tend to regard those character traits as unnecessarily timid. They will, both of them, lead their parties into the next election barring catastrophe. Maybe if the Conservatives had been beaten by Ukip last May and if Labour had done a bit better and if Liam Fox wasn’t damaged goods and David Davis reckoned to be flaky… Then, maybe, David Cameron might have been toppled. And maybe if the Lib Dems had lost the Eastleigh by-election last February and maybe if Vince Cable had made a serious grab for power… Then, maybe, Nick Clegg might have been a gonner. It’s still just about conceivable their parties might ditch them in the event of a worse-than-expected disaster at next May’s European elections. But I don’t know anyone who seriously expects that to happen. No, for better or worse, they will be the blue and the gold standard-bearers in May 2015. And then we shall see. Conventional wisdom suggests David Cameron will have to win outright to be sure of continuing as Conservative leader. After all, the last Conservative leader to fail to win two successive elections outright – Edward Heath in 1974 – is not a happy precedent. Yet if the Conservatives were to emerge as the largest single party once again then that would surely count as a victory of sorts, a defying of (current) expectations? In which case, Mr Cameron would have every reason to believe he could carry on, whether in a second Coalition or (much more tiresomely for him) as head of a minority government. For Nick Clegg, too, success could end up being relative. If the party held onto more than 50 seats that would be considered (given where the polls are now) a triumph; 45 seats good enough; 40 seats just about okay. The Lib Dems would continue to have enough parliamentary muscle to matter, especially if there’s another hung parliament. There is an alternative scenario for each leader: their personal doomsday. 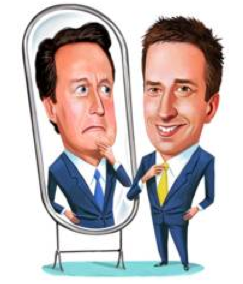 David Cameron could suffer the ultimate indignity of being beaten by Ed Miliband. A Labour majority, or simply Labour being the largest single party by some distance, would mean the end for Mr Cameron’s (by then) 10 years as Tory leader. What a disappointment to a political career that would be: played two, drawn one, lost one. As records go, it’s more David Moyes than Alex Ferguson. And if Nick Clegg sees the party reduced to fewer than 40 MPs – a drop of one-third – he will resign as the first Liberal leader in a generation only to have presided over my party’s falling Commons representation. Who would follow them? With Boris back in the Commons (I won’t even bother to say ‘if’: it’s when) he would surely prove irresistible to a party longing to be lead once again by a proven electoral winner. His unabashedly pro-immigration stance will jar, but probably not badly enough to prevent such a force of nature. For sure, he’s not Europhobe enough for what used to be called the right-wing of the party (and which is now its mainstream) – though this will be offset by his likely ‘dream ticket’ with that better-off-outer Michael Gove. And Boris is mischievous enough to relish the prospect of fighting a potential European referendum that Prime Minister Miliband may yet be forced to concede. And for the Lib Dems? It’s hard to see who can beat Tim Farron, the current party president. Leaderships often alternate styles – the ‘fat pope, thin pope’ principle – and his plain-speaking, northern, good-humoured passion will contrast with Nick Clegg’s smooth-talking, southern, occasionally tetchy, emollience. An energetic campaigner firmly identified with the party’s social liberal wing (ie, more tax-and-spend than Orange Book) he will use the next 18 months to try and develop some policy gravitas to leaven his authentically cheeky chappie personality. Some of his fellow MPs I’ve spoken to (including those on the same wing of the party as Mr Farron) are less-than-enthusiastic, reckoning he’s chosen the easy path during coalition of filling a role that guarantees you profile without getting your hands dirty. But it’s the Lib Dems’ 42,000 card-carrying members who will decide. Within two years, then, the Conservatives could well be led by Boris Johnson and the Lib Dems by Tim Farron: colourful and naturally funny social liberals, both of them. Imagine a Lib Dem / Conservative coalition headed by them – British political life would not be dull. But imagine it you’ll have to because their routes to the top depend on there being no second Coalition. Their jobs would be to make their parties feel better about themselves following painful defeat and to get them ready for the election that follows. They’ll both need 2020 vision.